Z-Wave Garage Door Controller helps keep buildings secure. Available for residences or businesses, Z-GD00Z-4 installs to current automatic garage door opener and connects to Z-Wave Controller or networkÂ to enable wireless control –Â including current garage door position. System knows if door is open or closed, which negates accidental openings, and can work in conjunction with other Z-wave lights, locks, and thermostats. Wireless control over garage doors is afforded viaÂ Virtual Keypad™ App on smartphones/tablets. 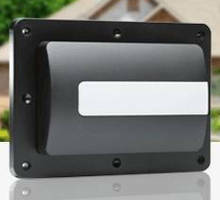 Springfield, MO -- DMP introduces a low-cost solution for Z-wave garage door control. No need to drive around the block to double-check that the garage door is shut! This is simply the easiest and fastest way to create the security & peace of mind that comes from knowing your home or business is secure. And, end users can now wirelessly control garage doors at their home or small business using the Virtual Keypad™ App on smart phones or tablets. The Z-GD00Z-4 Z-Wave Garage Door Controller is compatible with virtually any automatic garage door opener. Installers simply install the unit to the current garage door opener and add the new Z-GD00Z-4 to the Z-Wave Controller or network to provide simple wireless control, including current garage door position. The Smart system knows if the door is open or closed, so you never accidentally open a closed garage door when you were just confirming that it was closed. Combine this with other Z-wave lights, locks, and thermostats for total home or small business control. Learn more about the garage door remote controller accessory here. This update to the Virtual Keypad App also provides new Geofence Notification features including the ability to receive a Push Notification when an app user enters or exits a designated geofence that is not associated with your home or office. For example, get a push notification when your kids arrive or leave school. The Virtual Keypad App provides peace of mind and security for your lifestyle and your life. The Virtual Keypad App is downloaded to a smart phone or mobile device. It provides all the functions of the security system keypad right on the mobile device. DMP is a privately held, independent manufacturer of innovative intrusion, fire, access control, network, and cellular communication products that are designed, engineered, and assembled in Springfield, MO. DMP is the recognized leader in alarm communications over data networks, with products that are available through professional electronic security companies. For more information contact Melissa Pitfield at 417-831-9362, or visit www.dmp.com.